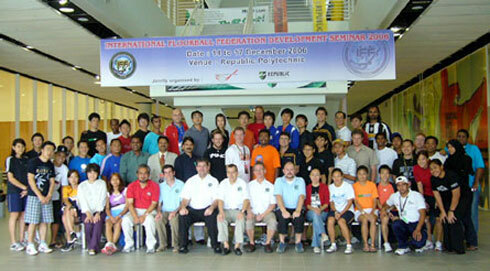 The Floorball Club (FC) comprises Registrants including Players. The Floorball Clubs (FC) must be affiliated with District Floorball Association (DFA), the DFA must be affiliated with State Floorball Association (SFA) and the SFA must be affiliated with Floorball Federation of India (FFI). The FC must be registered from FFI. 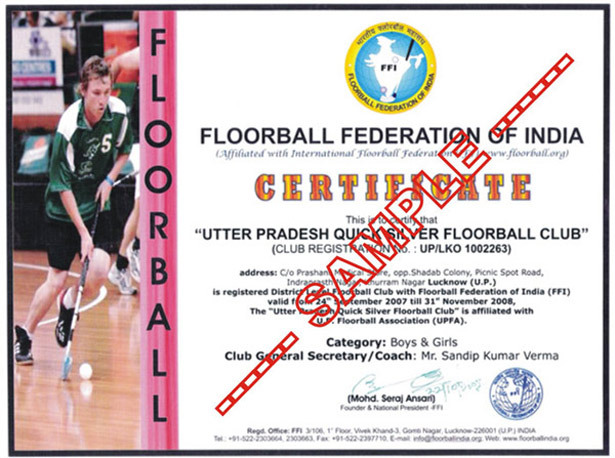 Sample of Certificate, which will be issued to the Floorball Club by the FFI. 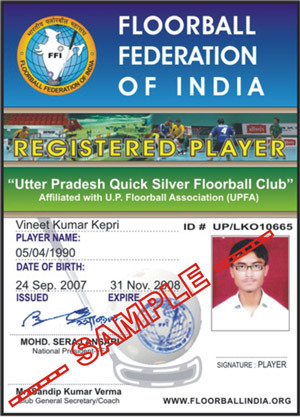 The FFI has designed a registration system of player, the player registration form will come through the Floorball Clubs (FC), the player will get registration form from Floorball Club, which will further submit to the FC, and FC will submit it to the FFI office, Lucknow. All registered players are authorized to play all FFI recognize games at any level, such as International, National, Zonal State and District levels. Sample of Player ID Card, which will be issued to the Floorball Club by the FFI. Note : once the player registered with any Floorball Clubs, they can’t play with other Floorball Clubs, if they want to play with other Floorball Clubs, they have to take legal transfer. To provide the opportunity for any person to play organized floorball and to assist participants in reaching their potential through the provision of programs for developing players and administrators. 2. To develop, train and support floorball Players. 8. Opportunities to play Exhibition Games & Tournaments outside the country. 9. Opportunities to train/play at All International Academy & International Floorball Clubs in all over the world. 13. Equipment discount program – Exel (Universal Marketing, Lucknow). 26. Equipment discount program – Exel (Universal Marketing, Lucknow). 1.The application must be proposed by District/State/Zonal Floorball Association as above. 2.The-application form should be accompanied by a demand draft or cash towards admission & Annual fee. No applicant whose application for membership is rejected can make a fresh application with in six months from the date of such rejection. Canvassing in any from for Membership of the Floorball Club will entail immediate rejection of the application. Please note that the current entrance & annual fee is as indicated above but the entrance & annual fee as applicable at the time of being admitted is payable. Please note that Admission fee, Annual fee, Player Registration/Annual fee & Transfer fee will be acceptable cash or by way of demand draft in favour of “Floorball Federation of India” payable at Lucknow only. Club Registration Form Can be obtain from FFI HQ, Lucknow for Rs. 200/- or you can download from website www.floorballindia.org/clubform.htm and include 200/- into demand draft of admission & annual free. The applicant shall appear from an interview before the office bearers of District/State/Zonal/National Floorball Association/Federation before e admission. The Federation has the right to accept or reject the application without assigning reason thereof. Use additional sheets wherever necessary.